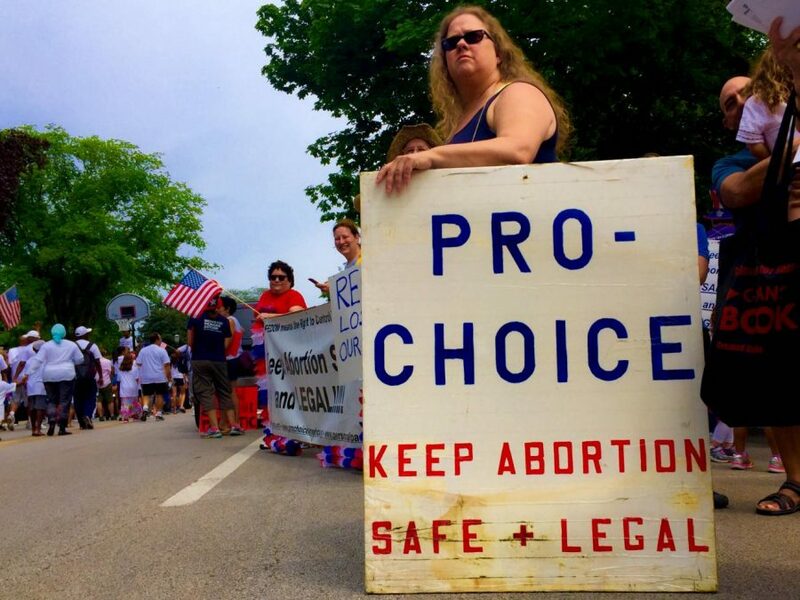 An abortion rights activist stands on the sides of the Evanston parade to voice her opinions. Some attendees used the parade as an opportunity to advocate for social and political issues. For many Evanston residents, the Fourth of July tradition means donning red, white and blue and setting up a lawn chair in a line on Central Street in anticipation of the annual parade. However, some attendees use the parade as an opportunity to advocate for social and political issues. For people like Evanston writer Betsy Storm, 63, the crowd the parade attracts creates a perfect platform for voicing opinions and garnering support. Storm said she became interested in gun safety advocacy after participating in the Million Mom March in 1999. Since then, she has discovered Moms Demand Action, an organization that advocates for “common-sense” gun reforms. This year, Storm decided to march for her cause at Evanston’s Fourth of July parade. Storm said she has marched for the past 30 years, and that this year, local activists have more passion and causes to march for since the election of President Donald Trump. Like Storm, “proverbial marcher” Leo Gideon, 79, said he has marched in over a dozen parades since moving to Evanston in 1979. Over the years, he has supported the Skokie Indians little league, the YMCA and Barack Obama’s senatorial campaign, among others. At this year’s parade, he marched with Refuse Fascism, an organization working against Trump’s administration. However, he said Refuse Fascism is wrongly labeled as a communist or socialist organization. In addition to the activists who march to support their beliefs, others such as Wilmette’s Jeffrey Salvadore, 22, join the scene to endorse political candidates. Salvadore, a long-time Evanston parade attendee and an intern for State Sen. Daniel Biss (D-Evanston), marched with Biss’ gubernatorial campaign this year. Evanston’s annual parade has become a popular platform for activism, regardless of their differing beliefs and causes.